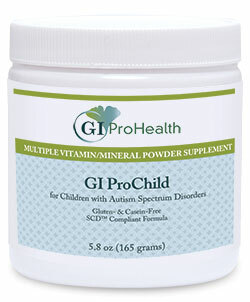 Multiple vitamin/mineral powder for children with Autism Spectrum Disorders. (SCD Legal) This multvitamin/mineral supplement designed for children with Autism contains 28 highly essential nutrients in amounts and ratios designed to target nutritional imbalances commonly observed in children with Autism Spectrum Disorders (ASD).Children with ASD usually have Abnormal gastrointestinal function, including chronic diarrhea and malabsorption. These issues affect a significant percentage of individuals with ASD and contributes to nutritional deficiencies. Food elimination diets and a tendency among patients to be highly selective eaters further narrow dietary sources of essential nutrients. GI ProChild™ addresses these inadequacies by supplying balanced amounts of vitamins, minerals, and trace elements in forms that are typically well tolerated by patients with ASD. Active forms of folate, B12, and B6 are included along with naturally-sourced vitamins A, E, and D. Iron and copper, often contraindicated in ASD, are excluded. GI ProChild™ is free of common allergens, including dairy, wheat, corn, eggs, yeast, and gluten. No sugar, maltodextrin, stearates, artificial sweeteners, colors, flavors, salicylates, or preservatives or any natural herbs are used. GI ProChild™ powder formula complies with GAPS, Gluten-Free/Casein Free (GFCF) and Specific Carbohydrate Diets (SCD™). The natural citrus flavored powder dissolves easily in cool liquids or can be mixed in foods. A convenient measuring scoop is provided for accurate dosing. NOTE: The capsule formula is similar to GI ProChild™ powder but the amounts of calcium and magnesium have been reduced to ensure the formula will fit in six medium-size capsules. How much should my child take? The recommended dose is 1 scoop per day for a child over the age of 4 years. 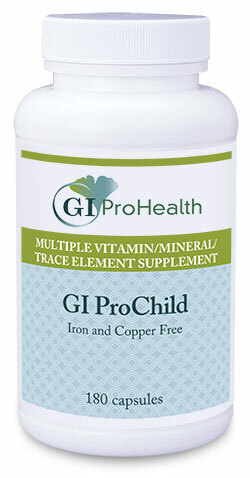 GI ProChild™ has a 2 to 3 year expiration date from date of purchase. 4 years old or older is the recommended age. Yes, GI ProChild™ is SCD™ legal. GI ProChild™ has a mild citrus flavor. Can it be mixed with food? GI ProChild™ can be mixed with room temperature or cold foods. Can it be mixed with hot food or drinks? GI ProChild™ can NOT be mixed with hot food or drinks, as it will decrease or destroy some of its active ingredients. Can it be mixed with fluids? GI ProChild™ can be mixed with any cold or room temperature foods or liquid. This supplement is so comprehensive that it enabled me to stop 6 other supplements I had been administering to my 4 yo with autism, ultimately saving me money but more over minimizing the amount of supplement I had to disquise in his food/drink (this can be very challenging in itself). Compare labels for yourself! We have definitely noticed wonderful changes in our 5 year old daughter who has CP and autism since starting this multivitamin. She is on a strict specific carbohydrate diet and has had no adverse affects since starting on this, only positive changes. Her DAN! dr approves of it too. We highly recommend it!!! !